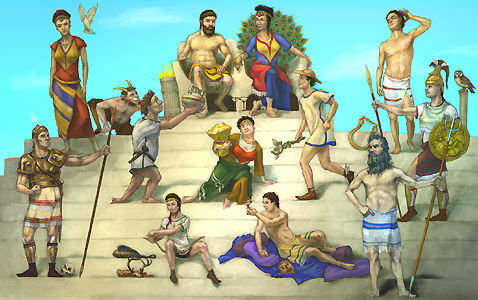 The Olympians are a group of 12 gods who ruled after the overthrow of the Titans. Of course they were all gods worshipped by the Greeks, and each of these gods represented a certain aspect of living. They were all related in some way, for example Poseidon was the brother of Zeus who was the wife and sister of Hera. The Olympians are all named after their dwelling place, Mount Olympus. This is a small map with all the members of the Olympian family. For further information, you can visit some of the online links listed on the links page, or you could check out all of my references. If the facts are not enough, you may at sqfara24@hotmail.com.